This page tracks what A&N say about playing shows in Europe. Added November 8th 2018: Danny and Jenny (47 minutes into the podcast): Any plans for Heart to tour? Nancy: Well there is big offer up on the table from Livenation right now. We’re talking. We’re trying to pound out the details. So next summer. It looks really promising. It’ll be Heart. Me and my sister and who ever is in that band. We’re trying to figure that out right now. We probably start in the late spring and go through the summer. Probably like 50 dates l. US. I’d like to do Europe too. Cos we haven’t done that for ages. Added March 219th 2017: In her interview with Eddie Trunk and her recent tweets Nancy has stated that she was ready to go to Europe in 2017, until Ann had other plans. Added September 21st 2016: Newsraid Reporter Molly Mcowan interviewed Ann while in the UK this summer and according to Heartmonger Bev, Ann mentioned bringing TAWT to the UK. Added January 30th 2016: Bospop has announced their line-up and no Heart. This makes an extension of the band’s UK tour into Europe very unlikely. Make sure you catch the band in the UK. Dates are selling out fast! In the UK the band “FM” will support Heart. Added January 16th 2015: With the announcement of the US Summertour additional European dates have become unlikely. The band most likely will need some time to charge between the last UK date (July 3rd) and the first US date (July 14th). On the other hand, the US tour is a Livenation tour and Livenation also runs the July 9th/10th Dutch Bospop Festival and the Belgian TW Classic (July …). 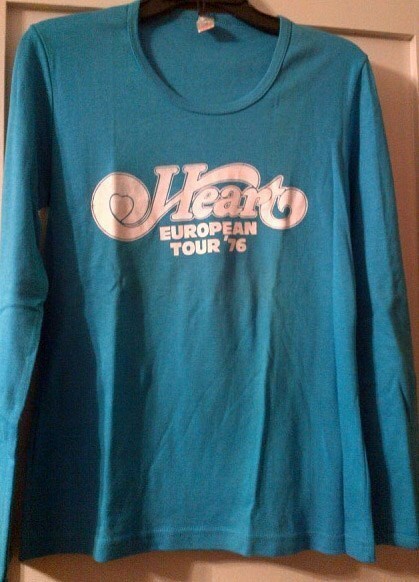 For the first time in TWELVE years Heart will return to the European continent to play for their fans. 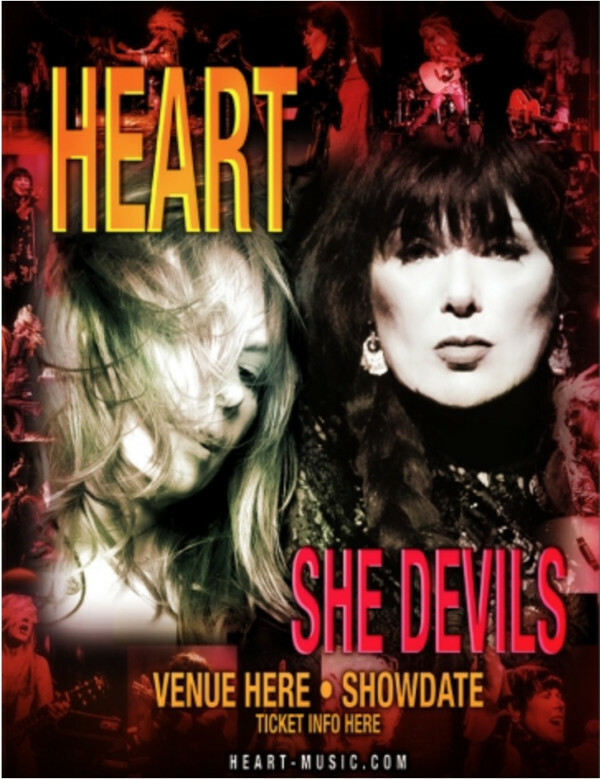 On December 5th 2015 Heart announced they will play four dates in the United Kingdom. Heartlinker would like to take a moment to thank Heart for doing this and to give some advice to all those Euromongers living outside the UK: this is your chance! It is unlikely Heart will return soon after this. Pre-sale password will be emailed to all existing Fan Club members as of Mon. 12/7 at 10am. Join the fanclub while you still can here. More Details: London: £73.50 each. Price includes all taxes and fees. Other dates are £44.00 each (Fanclub price). Public on-sale starts on Fri. 12/11, 2015. Tickets will be sold through Ticket Line. Added August 11th 2015: For some reason Heart was added to the list of artists of Austrian based Europolis Entertainment Group, which might well mean that Heart is available for bookings in Europe. The Google search suggests that the addition to the list was done today. Added March 24th 2015: IReadCulture: Well, looking ahead, does Heart have any big ambitions for 2015? Well, we have lots of amazing stuff coming up, some of which I’m not at liberty to talk about because it’s not absolutely locked in. But, we’re going to New Zealand, we’re doing more travel abroad and more creative projects of different types. Added December 13th 2014: In an interview from the United Kingdom, dated December 12th 2014, Ann was asked about returning to Belfast. Added November 6th 2014: Heart has committed to a July 4th Washington DC appearance with the Foo Fighters. But maybe their label Frontiers can lure them to Milan in April? We’ll know soon! Added August 16th 2014: Heart has scheduled a USA date on June 16 2015, 99% canceling chances for them to play Download 2015 f.i. Added June 25th 2014: Proving they’ll fly and do like to play outside of the US: Heart is likely to play New Zealand in 2015 (now confirmed!). Added March 23rd 2014: another UK interview. This time with AOR magazine March issue. Added March 23rd 2014: Ann Wilson said in an interview for Get Ready Ro Rock from the UK that Heart is planning to tour Europe in 2015. “Next year we’re coming back […] let’s just do it”. She explains that touring in Europe probably costs money, but they want to do it anyway. Added February 17th 2014: An interview from France with Ann, translated by Google: Q: “You have your star on Hollywood Boulevard, you are part of the Rock n ‘Roll Hall of Fame, your next challenge would be to come and play in France … A: There is much work to be done behind the scenes so that we can come to Europe. We all want to make this trip and at one time or another, it will happen. 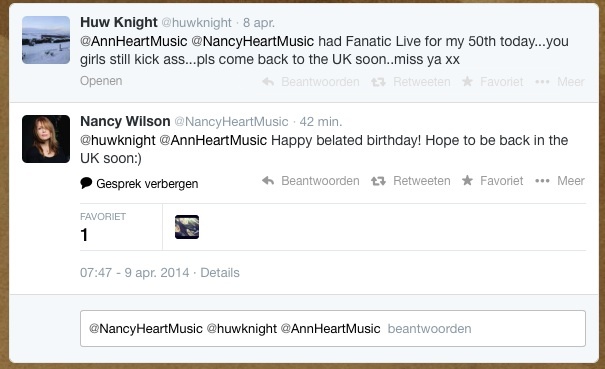 Added January 26th 2014: during the #AksAnnWilson Q&A on Twitter Ann Wilson revealed Heart will be going across Canada this summer with Jason Bonham, slimming any European hopes for summer festivals tremendously. Added January 10th 2014: click on picture to see this on twitter and REPLY!!! Added September 7th 2013: Jason Bonham hinted on his Facebook that the Heartbreaker Tour of the summer of 2013 was “only the beginning”. At least that’s what he heard. Might these plans include a trek over the ocean? Added August 31st 2013: USA dates are now scheduled for September, October, November and very likely December of 2013. Europe will at least have to wait for 2014. Added April 3rd 2013: Tonight’s show in Utah has been tentatively postponed to November 8th 2013 very quickly. That basically means that November was not reserved for any Euro adventure. Added March 9th 2013: We have confirmation that Heart will tour the US in June, July and August. Added March 8th 2013: with unconfirmed US summer dates for June 20th and July 29th and a confirmed US date for August 1st, it seems Heart’s occupied in the US this summer of 2013…..
Added February 25th 2013: Unfortunately two festivals (Bospop, NL and Werchter Classic, BE) I was hoping for announced their 99% complete line-up’s today and Heart was not among them. So after April 18th, we’ll know more and also more importantly: if Europe is among the very exciting something! Added February 19th 2013: in 2012 by this time we had a fairly sized US tour announced and things looked bleak. Actually: on the 13th of February in 2012 all hopes had been crushed after management said in was not in the cards that year. Now it’s a bit different. Yes, the major festivals have not announced Heart as a headliner, but not all artists have been announced yet. But more importantly: no Heart dates have been announced yet beyond April 9th (Seattle). We have been informed that they are going to tour this summer and that their entire year has been booked. So still a chance that part of their busy schedule is actually in Europe. So I’m not giving up hope! Added January 2nd 2013: the AOR issue of Classic Rock Magazine features a four page interview with Ann Wilson, where she tells about the new album Fanatic. the interview was done in New York city in October 2012. Most interesting quote: It’s a different experience seeing them play on their home turf rather than on one of their sporadic visits to the UK – something which is “in our plan for 2013, definitely,” says Ann. Added October 6th 2012: Okay, these coming months the European Festivals will be booking artists and announcing them. Some big ones like Download and Sweden Rock have already started announcing. I’m gonna need your help to keep track of all these festivals! If you see anything, make sure to contact me through Facebook or by commenting on any of the posts on the homepage (comments can’t be posted on this page of the site). Another interesting fact is that a couple of recent posts on Heart’s Facebook have been pointed directly to the fans in the UK (posts that promote the new album). Also about every post Heart makes, is flooded with comments by European fans to “come to Europe!”. Added September 5th 2012: Ann mentioned she’s hoping for some European Festivals in 2013 in an interview! Added January 6th 2012: heartlinker.nl: As no news has been found about European dates for a while now, the major rock or classic rock festivals are filling up their slots and US dates for Heart are being reported, I have to conclude that a 2012 visit to Europe seems less and less likely every day now. Added August 29th 2011: Interview with Ann at YulieYoungFreelance.com: As for what is next for Heart, Wilson said the band is continuing to evolve and grow. Their first biography is scheduled to hit bookstores in 2012, a Australian and European Tour is in the works and a brand new album is on the way featuring Grammy winning producer Ben Mink acting as co-writer for the project. Added August 24th 2011: On the Rock Hall show Ann mentioned that she heard about touring Europe in the summer of 2012. Question: You guys are gonna be in Europe next year? In Classic Rock Magazine´s September issue Nancy says she´d love to come to England. CD: What can we expect next, from Heart? Ann Wilson: When the album comes out, we, of course, will be doing some touring to support it. I’ve heard them talking about us going to Europe in the new year, and spreading the word around about Red Velvet Car and ourselves. I think Nancy and I in the future might record an album just the two of us. And we each have our various things we like to do. We like to be home, and just be people. I see more of the same: more playing, more singing, more writing. Just more living in the world.